For several reasons, heat being just one of them, I did not make it to the Green Market between early June and mid-September this year. That's pretty much all of summer's bounty left untouched and unsavored by me. Which makes me a little sad. I didn't do that much cooking anyway, though, and you may have noticed I did not post as much as usual, either. The good thing about blogging for fun rather than profit is that I do not have to do it if I don't feel like doing it; the bad thing about it is the same. I think everyone goes through periods when life gets in the way and they don't feel as inspired as they usually do about very many things, even the things that usually give them pleasure. So I didn't cook much, and I didn't write much, and I didn't read much. I didn't even knit much. I did watch a lot of TV. I'm not particularly proud of myself, but there you have it. Lots of mind-numbing, take your mind off of how hot it is, in how much of a funk you have found yourself, how little you want to turn your attention to the things that you normally find fascinating, engaging, and exciting. And even though I watched a lot of cooking shows, and food reality shows (yes, even "Hell's Kitchen," as stupid as I find it), I remained uninspired. Unlike the women of Theresienstadt, who compiled a cookbook from memory, while they were barely subsisting on scraps at the time, just so the knowledge wouldn't be lost, I sat on my couch and wallowed (and whined) in the heat and seemed determined to be as miserable as I possibly could until the heat ended and things cooled off somewhat. In my defense, there were other things going on that became tied in my mind to the heat, so that this summer was basically one huge surreal haze of heat and discomfort, both physical and emotional. I suppose in some ways that is how I needed to spend my summer, and the heat just gave me a measuring stick against which I could let myself mope, knowing that once the worst was over I could collect myself and get back to normal. Which has finally happened. Two weeks ago temperatures finally dropped below eighty and have stayed there long enough for me to be reasonably certain that fall has, finally, asserted its rightful place in the Chcago seasonal landscape. Since then, I have felt my blood quicken and start to flow more smoothly through my veins, and I have felt the itch to get back in the kitchen and start cooking again. And I went back to the Green Market. Misreall sent me an email saying she was ready to come into the city, did I want to meet her there? 'Deed I did, and early Wednesday morning we met up and wandered through the stalls. I was a little anxious because I was afraid I had missed out on everything, but there was still a lovely variety of produce from which to choose. So much, in fact, that I had to restrain myself from grabbing one of everything. I hadn't even really started to cook yet, so that first week I grabbed some onions, a few potatoes, and a couple of apples. I wanted to grab a butternut squash and some beans and some of the gorgeous beets, fennel and kohlrabi that I saw, but I decided to wait until I had a better plan for using them. It was such a joy to be there, though, that Misreall and I made plans to meet up again the next week. Which was last Wednesday. And even though the fall and winter produce have started to appear in abundance, there was still some corn available. Corn was the main thing I felt I had missed out on during my summer vacation, so I decided to grab some up before it disappeared completely. I decided to make corn chowder. Another stall had some gorgeous poblano peppers, and I thought they might make an nice variation from the red bell peppers I have used in the past so I bought some of those. 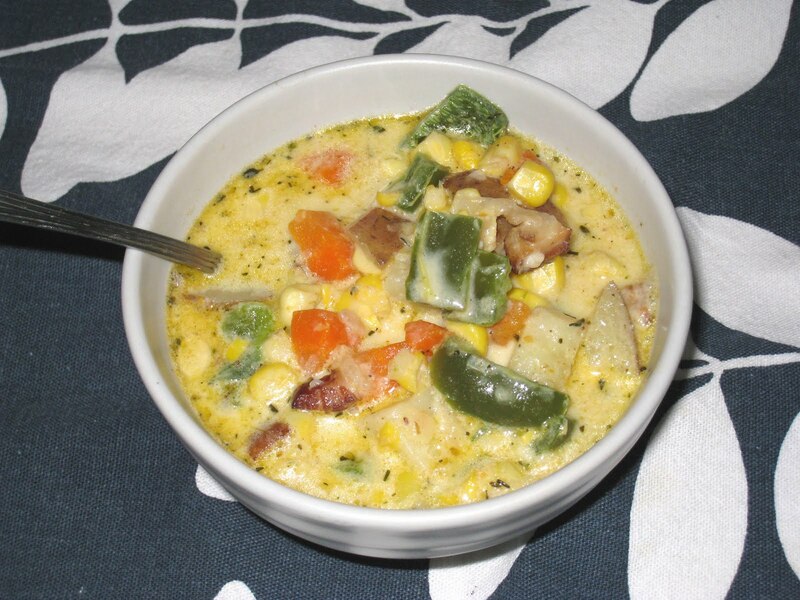 The last times I made corn chowder I used ham, as that was what I had on hand, and it was quite delicious on those occasions. But this time I had my lovely Dreymiller & Krey maple-smoked bacon ends in the freezer so I used those, with most excellent results. The poblano peppers did exactly what I hoped they would do - offered a rich, dark, slightly smoky overtone to the dish. I was a little afraid the corn might be too close to the end of the season to still be good but it was light, sweet and crisp. I hope they still have some this week so I can get one more taste before I start roasting that winter squash. Melt butter in 3-quart saucepan over medium heat. Add bacon and cook until done, about 5-7 minutes. Drain all but about 2 tablespoons of the fat. Add onions and cook until translucent, approximately 5 minutes. Add carrots and cook another 5 minutes. Remove the corn cobs and the bay leaf and add the potatoes and poblano pepper. Bring to a boil, reduce heat, and cook for another 15 to 20 minutes, until the potatoes are just tender. Add the corn, thyme and paprika and cook another 5 to 10 minutes, until the corn is warmed through. Adapted from a previous adaption of Elise's recipe on Simply Recipes. This chowder sound amazing. I like to make it skinny by using reduced-fat milk and reduced-fat butter. It still taste great. It is pretty amazing, Nancy, and I imagine it would still taste great using reduced fat milk and butter.